Certain tools you’re required or encouraged to have as a Notary Signing Agent — your journal, seal, and certificates, for example. Then there are the lesser-known items that make your job easier and protect your valuable data. From business cards to super-savvy smartphone apps and invoicing software, veteran Notary Signing Agents weigh in on the products they use most and like the best. Camera Scanner Smart Phone Apps: A number of downloadable applications make it easy to turn your smartphone into a pocket scanner. Wisconsin Notary Shannon Brogan has had good experience using the CamScanner Phone PDF Creator app, per a client request, while Pennsylvania NSA Roland Paquette recommends Grizzly Labs’ Genius Scan, a free iPhone download that allows quick transfer of documents and PDFs into other applications, such as DropBox, Evernote, Google Drive and Twitter. It also features image editing and search capabilities. Notary Privacy Guard: Designed by a Notary, this easy-to-use tool protects the confidential information of your signers, ensuring that you are compliant with federal privacy regulations. The guard slips easily into all NNA Notary journals, and allows your current client to sign your journal without compromising the private information. Business Cards: Whether you order them through the NNA, Office Depot, VistaPrint.com, or your own local printer (all which have been recommended by NSAs), business cards are a great way to advertise your service and expand client reach. Many NSAs also use cards to professionally identify themselves to signers to help put them at ease. NNA-certified NSAs candownload the NNA logo for use on cards. Veteran NSAs recommend including your email, phone number and fax number, but not your home address, for safety reasons. New York Notary Michael Gilman suggests including your city, or mentioning the counties you serve, and recommends using a professional email address rather than a personal one. NotaryAssist: Designed specifically for Notaries, the all-in-one NotaryAssist software helps you manage every aspect of your small business, from scheduling and mapping client meetings, to invoicing clients and tracking expenses. “It’s so easy to use and very valuable at tax time,” shared Indiana Notary Linda Bennett, who has been using the software for four years. “I print out business reports to take to my accountant and all of the information that’s needed is right there.” The software is regularly updated to calculate current rescission dates and mileage rates. Printers: Speed and reliability are key when choosing your device, but the options can seem endless. The NNA’s NSA LinkedIn page features threads filled with printer recommendations, including where to buy them (many NSAs opt for discount online suppliers over more expensive local stores), what type to buy (dual tray printers offer convenience, while purchasing page separator software may be a more affordable option), and what features to look for, including wireless capability and the ability to print directly from one’s smartphone. 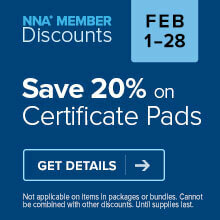 Check out the NNA Partner Programs for special member discounts from companies like HP, OfficeMax, and others. From paper brands that help prevent printer jams, to the best GPS systems or online suppliers, you can find Notary Signing Agents discussing all the tools of the trade on the NNA’s Notary Signing Agent LinkedIn discussion group. Have any tips or “can’t-live-without” recommendations you’d like to share with the NNA Notary community? Post them on the NNA Facebook page!